Aah, the art of French kissing -- the bise -- that is. But there's no tongue involved in this kind of French kissing. Rather the bise or bisou is the cheek-to-cheek kiss used for greetings, and also a common sign-off on friendly letters (much like we would sign "Love,...." even it's not a love letter). You can plant them firmly on the cheek, but for more casual acquaintances, often the lips are in the air, making a "mwa" sound, while the cheeks are pressed together. The American in me finds it funny to see Anthony cheek-kissing people, and especially other men, but yes, even they do it. It also feels slightly odd to have 11-year old boys happily come up to kiss me hello, since I can hardly imagine American boys of that same age who would be half as willing to give out hugs to adults ("ugh, you're embarrassing me..."). But how many kisses? That is the question. Below, my friend Christine greets her mom Liliane in Normandy. Christine is not, in fact, flipping me the bird British style, but rather counting the number of bisous with which she greets her mother -- two in their case. So the bise is for casual acquaintances, and for your nearest and dearest as well. Christine's brother-in-law hails from another region and goes with three, and I have a couple friends who go with four. The minimum nearly everywhere in France is two, so basically you just go in for the one, two, then sit there bobbing like one of those colored-water woodpeckers till you figure out if you should keep on keepin' on, or if your kissing is done. By the way, there is no set rule on which side you kiss on first, so sometimes it happens that you both feint to one side, then to the other, and in the end you practically end up kissing on the lips. Somebody has bothered to make a fabulous color-coded French Kissing map to help you figure out what to do, where. 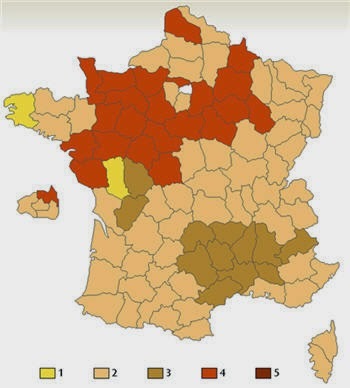 If you're wondering, Paris is the only un-colored blob in the upper middle of the country -- meaning there's no urban norm at all -- with some double-kissing suburbs, surrounded by a veritable see of quadruple-kissers. Sometimes wonderful, fatty cow's milk is just not wonderfully fatty enough. So French cheese makers add extra cream; these cheese are called double cream. But occasionally, the cream-enhanced wonderful fatty cow's milk is still not wonderfully fatty enough. So guess what the French do? It's just brilliant: They add more cream. This kind of cheese, my friends, is called triple cream. Triple threat is more like it: can it sing, dance, and act? No, but it tastes great, is impossible to stop eating, and will probably clog your arteries. Brie can be a single cream, double cream, or triple cream cheese, at which point it becomes a triple threat, triple cream cheese. It can also be made from whole or semi-skimmed milk, which leads to the conclusion that it can not only be triple or double cream, but half-cream as well (not a real term, mind you; just conceptually). It is ubiquitous -- a French classic and possibly the most famous French cheese. 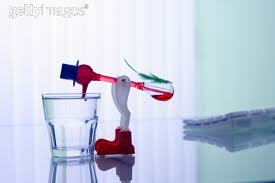 As such, it can be made with pasteurized or raw milk and can be industrial, artisanal, or farmhouse. Unlike many cheeses, a Brie can be made anywhere, although it is named after the place where it originated, in the area of Brie, which is the modern-day department of Seine-et-Marne. The most famous and elite of the Bries are ones that are tied to specific regions, like Brie de Meaux and Brie de Meluns. But there are many others as well, including Brie de Provins, Brie de Nangis, Brie de Coulommiers, and Brie Noir de Nanteuil, to name just a few. Like a Brillat-Savarin or a Chaource, Brie can be a mountain of creamy, buttery goodness. If it is of high-quality and high-fat, it can be both creamy and oozy at the same time. It is aged for at least 4-5 weeks and sometimes even more, but a great one will not last on your plate more than 4-5 minutes. Yes, you do eat the moldy white crust, which -- as you might predict -- tends to be more delicious and delicate on a higher-quality Brie and chalkier and thicker on an industrial Brie. A less creamy, industrial version (usually a generic Brie and not one tied to a specific location, as in the specimens and photos shown here) can be rubbery and bland, however. So choose wisely. 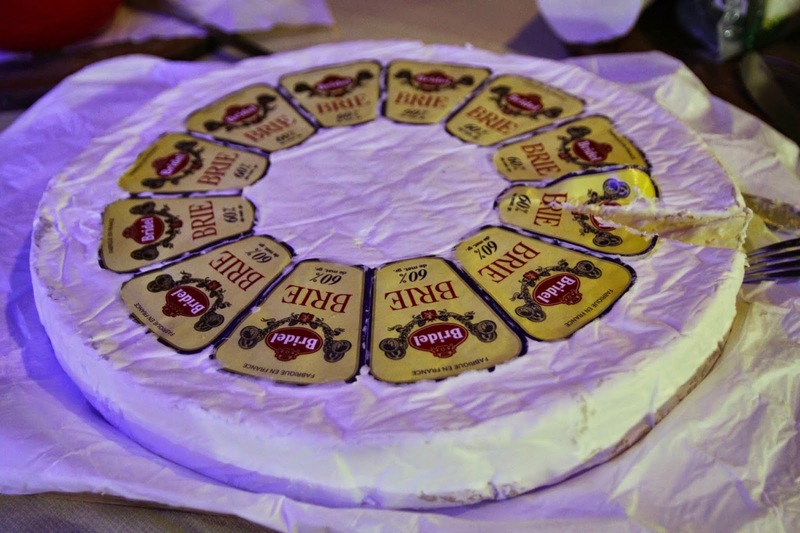 Brie is a single, double, or triple cream cheese, made in double, triple, and quadruple kiss country (as well as no-kiss country, since a Brie can be produced on foreign soil). And like the bisous, it's just so very, typically French. Karen, you are a fabulous writer! I love how you write about a subject and a cheese and link it together. Brilliant! Keep up the great work! You are a master!